Compact, manoeuvrable and lightweight, the Canon EF 70-200mm f/4 L IS USM lens is a full-frame telephoto lens that features 4-stop image stabilisation and a constant f/4 aperture. It delivers the very finest in L-series lens optics, ensuring high-quality optical performance. 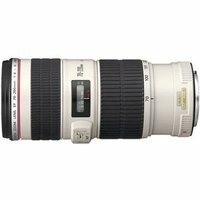 This 70-200mm f/4 L ISM USM lens offers inner focusing and an Ultra-Sonic Motor (USM) for quick and quiet autofocusing.